Help Buck and Wanda retrieve priceless relics! After plane trouble, a pair of fortune hunters stumble upon an unexpected adventure. Together they must gather relics in mysterious lands, and only the bravest soul can succeed in this marble popping madness! Relic Rescue is rated 4.3 out of 5 by 55. Rated 5 out of 5 by puppygurl from more I wish this game had a part 2....150 levels is not enough. Rated 5 out of 5 by Marg2 from Great Marble Popper - FREE - no need to buy anything I really enjoy marble popper games and I think this one is right at the top with the best of them. If you run out of marbles, you can choose to REPLAY the level without having to buy anything. And you don't have to wait a given period of time like so many of the free games. There is no need to buy additional marbles in hopes of winning the level. Boosters can be bought with gold coins earned for winning levels. They should be used sparingly and only on "impossible levels", i.e., level 64 for one. I used boosters on 5 or 6 levels out of 150. If you love marble popper games, give this one a try. Rated 5 out of 5 by Arjuna12 from One of the F2P games, that is really F2P From my experience on the internet F2P games are mostly more expensive than games you buy - if you wanna get anywhere that is. I tried some of the free to play games on this site. I noticed that anywhen either you have to wait half an our to get another goodie or buy another move or something like that. It doesn't mean that I mind paying if I like a game. But this game is totally playable without paying at all. And it's much fun at that too! I love bubble popping games anyways. If you say it can't be played without paying, you're just too impatient. Replay levels if you fail. And every half an hour you can play bonus rounds (the lowest is level 10). With some exercise you don't have to pay. I replayed it 2 times now. And you don't have to get the 3 stars, they won't give you anything - at least not that I noticed anything. Just get as many coins as you can before ending a level. Only thing that I found a bit disappinting is that the game just ends at level 150, without any ending credits or something. Give us more levels, please! 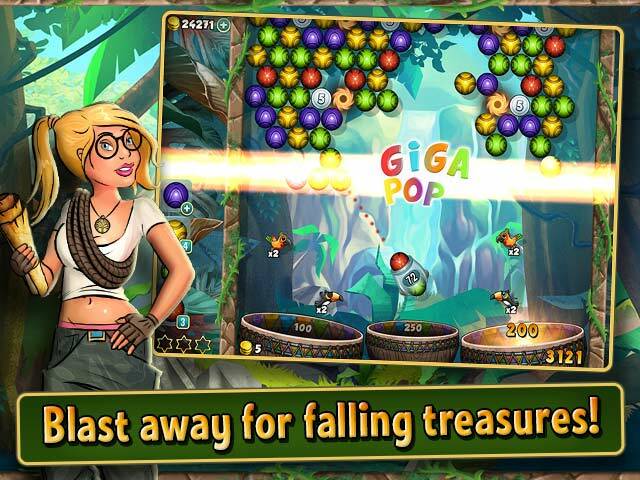 Rated 5 out of 5 by jazda from Popper fun First great popper game for me. Never thought I would like this one but I can't stop playing. Some levels harder to get through and I need to start over a few times. All in all a great enjoyable game. 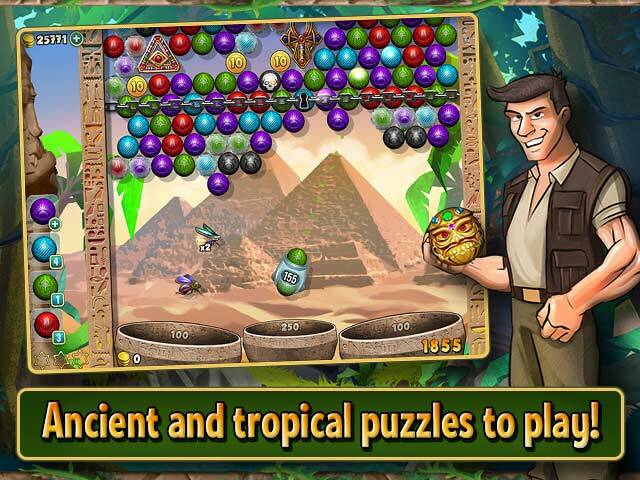 Rated 5 out of 5 by kathypederson from Fun Marble gme I love different games. This one can be clallenging. Keep up the good work! Rated 5 out of 5 by SandiBeach6 from Great Marble Pop Game Lots of challenging levels. You will enjoy it, worth the money. Rated 5 out of 5 by jaimecata from Great for coordination Love the game. Fun to play with no time limits. Great to shoot angles to achieve your goals. Rated 5 out of 5 by mirajanihiggins from Aghhhh! What villainy is this? I should never have started this game. It is soooo addictive! You just keep coming back over and over again! I just wish there was a Strategy Guide for this one--sometimes I've had to move on to the next level without getting the stars or relics because I just can't figure out how to do it with the number of balls allotted me, but I guess that if I weren't so cheap I'd buy more power-ups or balls...still, it keeps me coming back for more! 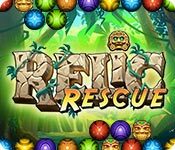 Rated 5 out of 5 by Micki_micki from Relic Resuce I love this game and would love to buy it because I am not always where there is wi fi and I would also like to buy it for my tablet. Rated 5 out of 5 by peggieb from Good game Liked this game a lot. It gets harder with the levels. Rated 5 out of 5 by 1luvmigms from Fun, fun, fun I have always had one game that I loved the best above all others.....however, since Relic Rescue my number one game has changed. I love this thing. Makes me crazy in a great way. Just can't keep away from it. Rated 5 out of 5 by ljohnson777 from This game is addicting... I didn't expect much from this game.. but I find that I play it for hours.. just to get to the next level. Some levels are impossible to win without buying coins... but I just love this game. Rated 5 out of 5 by gimmegames from Relaxed play in a very pleasant game environment Relaxed but challenging. I'm past level 100 without spending any money, so doesn't feel like one of *those* games. Nice music and pleasant graphics. 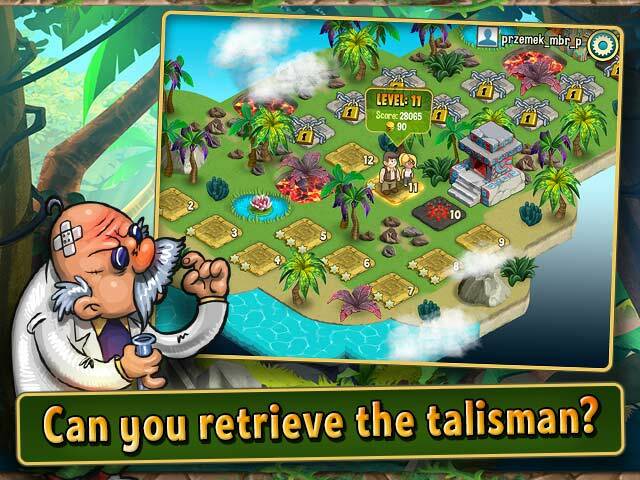 Rated 5 out of 5 by marionwood from Relic Rescue I love this game, very addictive, challenging and fun! Rated 5 out of 5 by pzzllvr from Very Addictive! I love this game!! The challenge gets tougher as it goes along. Be careful how you spend your coins, you WILL need them in later levels, 89 is a rough level. I wish BF would offer more of these games. I really like have levels to reach, coins to gain, and power ups. I have never been addicted to a game until this one, and I have been a player for years! Rated 5 out of 5 by sugartoes43 from So addicting ...... love the style of the puzzle popping and the higher the levels the more intense it becomes. I have found myself lost in this game for hours... And its free to play what more could you ask for. Rated 5 out of 5 by vmomahhj from awsome Great game ,fun and interesting .Would recommend to every one . Rated 5 out of 5 by pennmom36 from Bubble Shoot F2P I love bubble shoot games and this one is surprisingly good, and surprisingly doesn't seem to require the player to purchase coins and gems just to advance as most of the other Free to Play games of late! The goal is simple, aim the cannon where you want to shoot the colored cannonball to match at least 3 of the same colored balls. You can also cause the ball to ricochet off of walls, but the balls will stick to any other ball it comes in contact with. The goal is the same on all levels, and that is to free the golden key, but you also want to free the 3 stars if possible on each level which will earn bonuses when you collect enough stars, but sometimes it isn't possible before freeing the key. There are relics to free which contain gems that explode and give extra points. There are gold and silver coins to free, and as every coin, relic, star and key fall, they will bounce off of toucans and parrots flying around for 2 and 3 times the points every time it hits a bird before falling into one of three different bowls worth 100 and 250 points. There are several bonuses to earn such as, a JOKER which will match any colored ball, BINOCULARS which will allow you to scroll up to the top of the board before you start so you can figure out where all of the relics, stars, coins and key are, PRECISION AIM, which improves the cannon site line, or BOLTS which destroys a whole line of bubbles. Some of the bubbles are black and cannot be matched so you will need to free them by making matches above them so that the black bubble falls. At the end of each level, you will get an explosion bubbles and you need to quickly aim the cannon so that you can shoot as many bubbles as possible through a halo that moves back and forth at the top, those bubbles turn into coins. Every 10th level gives you a mini game such as a group of three or four rings with different colored sections that will break like glass exposing gaps that will allow you to shoot the relic in the center for coins and bonuses, but you have a limited number of bubbles to shoot as shown on the cannon. If you run out of bubbles before the key has been retrieved you will have to purchase the desired number of each colored ball. I really enjoyed playing this bubble shoot game, enjoy! Rated 4 out of 5 by ccar51 from Nice game Made it all the way to 150 on my second try. No money spent, only coins earned. It's got some glitches. The first time I couldn't go back to bonus rounds after I passed 100. The second time I couldn't go back after 135. The ending was VERY anticlimactic...you complete 150 and nothing happens. Buck and Wanda are just standing there on 150 waving their stupid little wave and you have to exit out of the game. There should at least be some bells and whistles for completing the game!!! Rated 4 out of 5 by xaris77 from Would be five stars if it weren't such an expensive free game Everything about the game is fantastic with one exception. The bonuses are so slow to earn that once you get to the advanced levels they will probably not be available when you need them. And purchasing extra coins to buy the bonuses buys you so little that it is not worth the effort. you can spend $9 on coins and not get enough to get you through a single level. I wish the developers would rethink this issue. Rated 4 out of 5 by anlome from Great Game...Not Enough Levels I am totally addicted to this game...but I got to level 150 and it stopped. BOO! Would really like more levels added on please. Otherwise, fun, relaxed, non-timed game makes it fun to kill a couple of hours on a Sunday. Rated 4 out of 5 by snowball42 from Pay as you go game I like the game however you have to keep purchasing coins in order to advance. This makes the game expensive as you must continue buying coins therefore you pay as you play. This is almost like being at a casino. No money, no play!